With some nice weather we decided to venture outside this week. 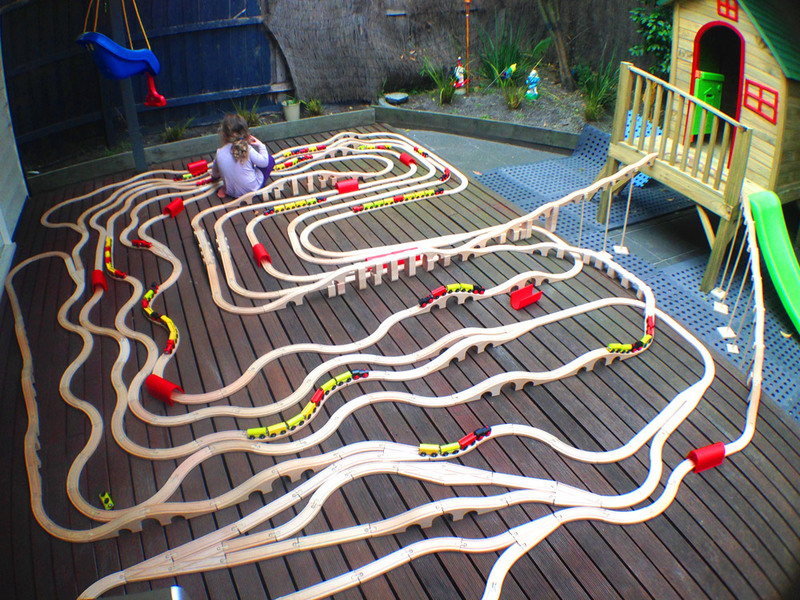 Scarlett our black cat found this all very interesting and the cubby house made a fantastic loop for the track. 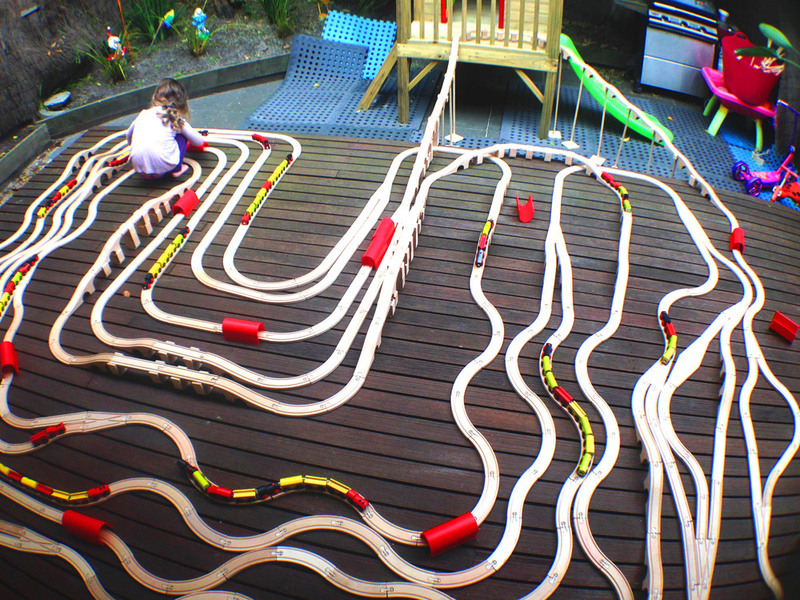 This train track was a lot of fun. We had had the idea of using the sparklers but needed to wait for the kids to go to bed. This actually ending up working really well as they looked great when is was pitch black. It’s always nice to have a little help from friends – thanks Tobin and Shane! The final track certainly started to make our lounge room look small! This week we decided to launch into the air. With the addition of a few homemade supports we are now attaining some serious ground clearance. If you have any suggestion for future tracks please let us know! This week we went for spirals – rather like the effect we achieved. Ok, so this track nearly beat me. Perhaps we got a little to adventures without enough tracks to carry it off. Indeed the balancing act with the bridges took about 45 minutes and then …. well … watch and see. This week Granny was in town and was keen to help. Indeed she managed to build our most impressive bridge so far! 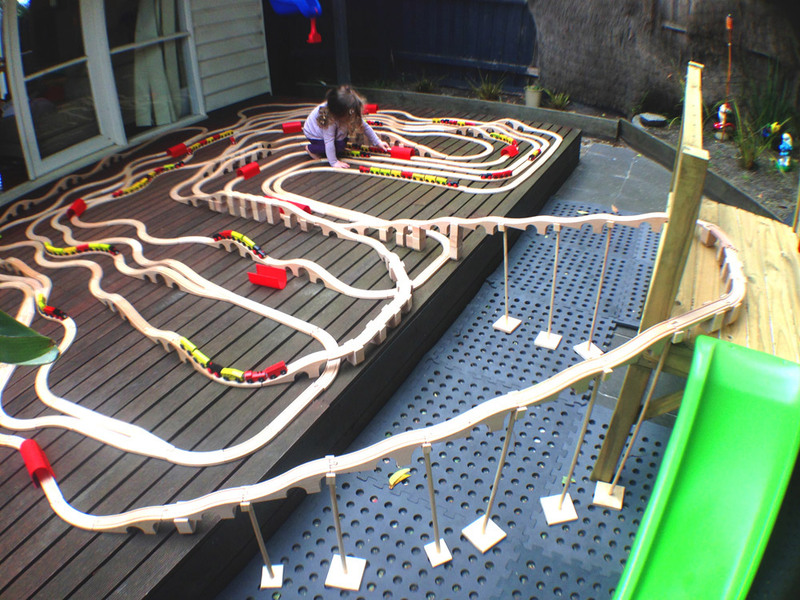 This week Keira was down with the flu as we did the track — You can see here just sitting in my lap for half of the build. Lucky we had uncle Connor staying with us. He managed to step in and help finish the track off (he also bought chips which is always are winner!). Week 10! We’ve gone double digits 🙂 Arya is now picking and choosing which tracks to lay and then handing them to me. She also decides when we will finish filming at the end!